Shopping isn't always as fun for the little ones as it can be for Mom - up until now! 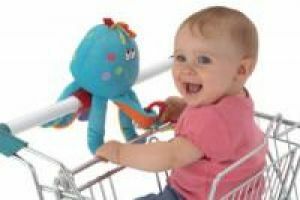 Trollie Ollie is a cute and cuddly octopus toy that attaches easily to shopping carts to keep your little one entertained and happy on long or short trips to the store. With his cheerful smile, bright colors, fun varying textures, and exciting sounds, he's a sensory delight!